The Vietnam flag has a very simple design but it has deep meaning behind it. The flag features one five-pointed star in the center. Each point of the star is representative of the main classes of society in Vietnam. One point represents intellectuals. The second point represents farmers. Another point is meant to represent workers. Businessmen are represented by the fourth point, and military personnel are the final class symbolized on this national flag. In the 18th century, one of the original flags was adopted by Emperor Gia Long. This flag was a yellow banner with a red circle placed in the center. The flag of South Vietnam was designed at the end of the 19th century and featured three stars that represented the Qian trigram. In later years, these stripes represented the northern, southern and central regions of the nation. In the late 19th century, the flag of France was flown when this country took control of Vietnam. Throughout different regions, other flags were flown, including the Vietnamese imperial flag. A flag similar to one used today was adopted in 1945. Ten years later, the flag was modified to sharpen the edges of the star. This flag was first used by North Vietnam. 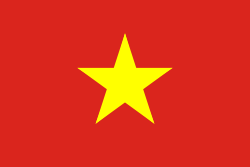 South Vietnam on the other hand used a yellow flag featuring three red stripes. When Vietnam was unified in 1976, the flag of North Vietnam was adopted. The city of San Jose in California prohibited the flying of Vietnamese flags on city flagpoles in 2017. Other cities have also banned the Vietnamese flag, including Westminster and Milpitas. Until the 1970s, North Vietnam and South Vietnam had different national flags.